I just realized that I never wrote the story about my trip to Napa. Sorry about that, hopefully I’ll write something on that subject soon. This past week I took a staycation in order bottle the 2010 wines including a Lodi Zinfandel and a NC Syrah. Both wines have been aging for a year in 32 gallon Vadai Hungarian oak barrels. The Lodi Zinfandel was the first wine I made from California grapes. The Zinfandel grapes were extremely difficult to move through the crusher/destemmer (we have a manual one). However after tasting the wine this week, I would now say it was worth the effort! However, the Zinfandel did have one issue. It was very high in alcohol – about 16.5%. Fortunately, it does not taste like it. We kept half of both the Zin and Syrah in their original state, and used the rest for blending. The NC Syrah was about 12% alcohol by volume. 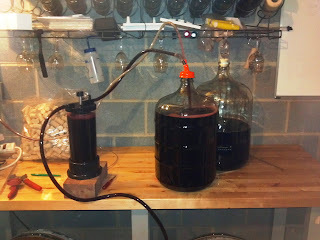 The first thing I did was move about half of each barrel into carboys for the blend between the Zin and Syrah. 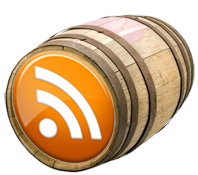 That blend will be about 14.5% alcohol by volume. We now have 6 cases of the Zinfandel, and 6 cases of the Syrah. 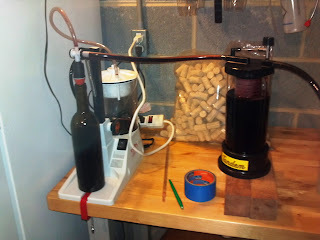 I plan on bottling the blend sometime over the next few weeks. Once the barrels were empty, I cleaned them out and filled them with the 2011 wines. That included a Paso Robles Grenache and an Amador Cabernet Sauvignon. I’m a little worried about the Cab because it tastes a little green to me. I’ve read that this taste is the result of the grapes being harvested too early and before the seeds have fully matured. Luckily the green flavor is not dominant and the wine has also has a strong cherry flavor. Hopefully, after some time in the barrel the cherry flavor will concentrate and the green flavor will diminish. Time will tell. 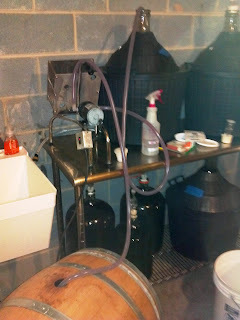 There were two gallons of the Grenache that were left over after putting it in the barrel. I decided to go ahead and bottle the remainder as a “young” version of the wine. It is light in color, but strong in flavor, oddly enough. Now I have some wine to give as gifts this holiday season! We didn’t get grapes this past fall, in order to put funds towards a shed to move our yard equipment out of our basement. This makes the basement a little cleaner for my winemaking activities. I think next year we’ll be doing some fruit wines to fill a little of the void. Cheers! Copyright © 2010 by Robbie & Kelly Rogers, All Rights Reserved.